Claude Bosi grew up imbibing the excitement inside a live kitchen and how cooking involves teamwork. Like a a fish takes to water, the celebrated 2 Michelin-starred French chef took to kitchen, and is today one of the most sought after chefs in restaurants across the world. 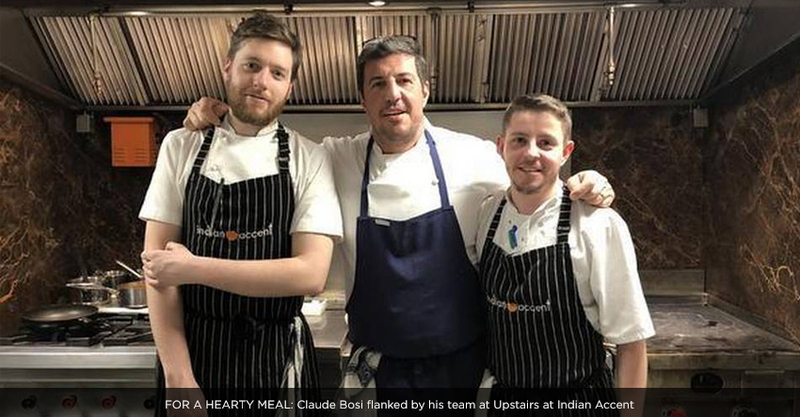 In Delhi recently, Chef Bosi cooked up special meals for patrons at Upstairs at Indian Accent. As guest chef, he presented a six-course menu at lunch and a nine-course dinner. Lobster pepper sauce, sea bass grenobloise, warm beetroot terrine feta cheese and passion fruits were some of the delicacies that the presented to the patrons. Tell us about your love for food and who influenced you while you were honing your skills as a cook? I have been cooking now for nearly 32 years. My parents had a bistro Chez Yolande, my mum's name, at Lyon where I grew up. Watching my mum in the kitchen and dad out the front, without knowing, I got the cooking bug from them. Later on, I worked with some great chefs in France but the main ones would have to be Alain Ducasse and Alain Passard. Which is your favourite dish and tell us the process of preparing it? My favourite dish on the menu would be my mum’s tripe and cuttlefish gratin. It is a dish she used to cook for my dad. The only thing with this is that there isn't really a recipe, it's only me in the restaurant who cooks it and I do it just by taste! Who was the first person who tasted your meals and what was his or her take on your cooking? It was actually the first person who employed me in England for the head chef position. I was not at all sure of some of the English dishes I was doing, I think they liked what I was doing. I was there for a while. What is your opinion about Indian food? I absolutely love Indian cuisine. That is one of the reasons I decided to come to the Upstairs at Indian Accent restaurant. I love learning new dishes and there has been a lot of that on this trip. New Delhi is an exciting, vibrant place and home to so many unique flavours and taste. Unfortunately, being French, I am not great with spices, but I have used the local produce in a slightly different way. I did not change dishes too much. For me, it's about sticking to the foundations of a dish but seeing what the produce can do to highlight these elements. A lot of my dishes are quite clean without lots of additions, and so far many different palates have enjoyed the dishes, the response has been great. What is your advice for budding Indian chefs? Work hard, stick to what you believe in and make sure you have got someone in your life that brings you back to earth when people tell you that you are great and take every day as a new beginning. What is your recipe for millions of starving people? I don’t really know. I just know we are wasting a lots of food in this world. And I feel we should look at the waste and make an honest attempt to stop this. Do titles like 2 Michelin starred chef mean that you cannot do anything wrong inside the kitchen? I wish, but I make mistakes like everyone else.